Last one and half months I was working on my Aeroponic System V2. In this post I will dissect the system and will see each component and what it does. I would like to thank my wife for her tremendous support for helping me in every phase of the development, also she takes care of the germination process and replanting to the system. Here the plants root are growing in Air and the nutrient mixed water will flow through the pipe in periodic intervals. As of now we are growing Spinach and Amaranth. I fixed a valve to control the water flow. Without this valve the first outlet receives more water because of gravitation and subsequent outlet receives less and the last one receives none. With this valve I can adjust the water flow and helps to get water to each outlet equally. Normal hydroponic systems use water tanks to hold the nutrient mixed water. I decided to buy one tank as well but the tank is 1 feet tall, that means the vertical growing medium must be place above the tank level and I will loose 1.5 feet from each growing medium. 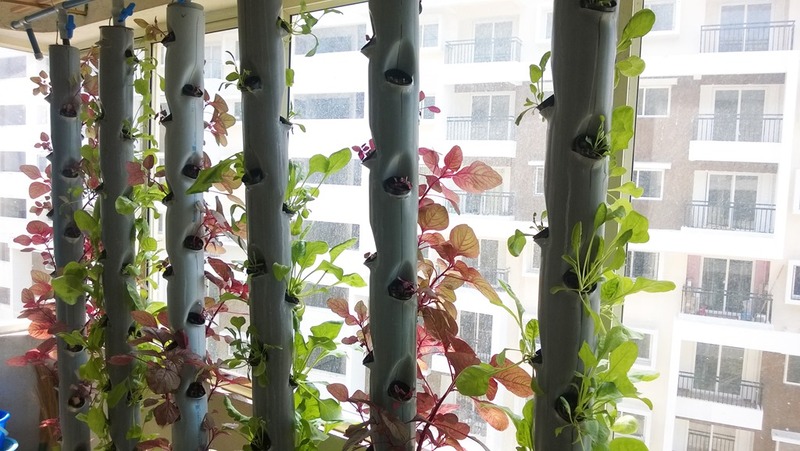 I have total 6 towers and in total I will loose 9 feet of growing medium and will reduce around 30 cups. After a lot of thoughts I come up an idea to use 6 inch pipe as the reservoir. With simple math I realize that I could store more than 50 lts of water in a 10 feet 6” pipe. The reservoir has a Submersible pump that can pump 12000 liters per hour. It also have a wave maker to mix Nutrients or pH modifier agents. 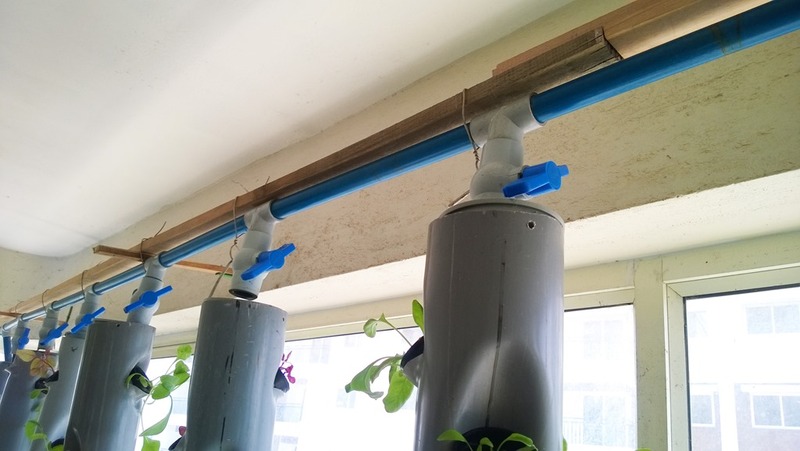 I made two containers from a 4 inch PVC pipe and connect two dosage pumps to pump nutrient from Nutrient tank to Reservoir. I can add Nutrients by pressing a push button in the control board or via the mobile app. For each press of Push button will add 10 ml of nutrients. Through mobile I can add any amount of Nutrients and can do it from any where from the world. Controller system will automatically activate the wave maker after adding nutrients, so the nutrients will get mixed well. The controller system has different components, I numbered each component for ease of explanation. 1. Water Pump switch: Water pump will run in a periodic interval controlled by application running in Rasbperry pi. In some situation I wanted to run the pump immediately without waiting for the interval. With this switch I could run the motor immediately. I can also activate pump from my mobile application as well. 2. 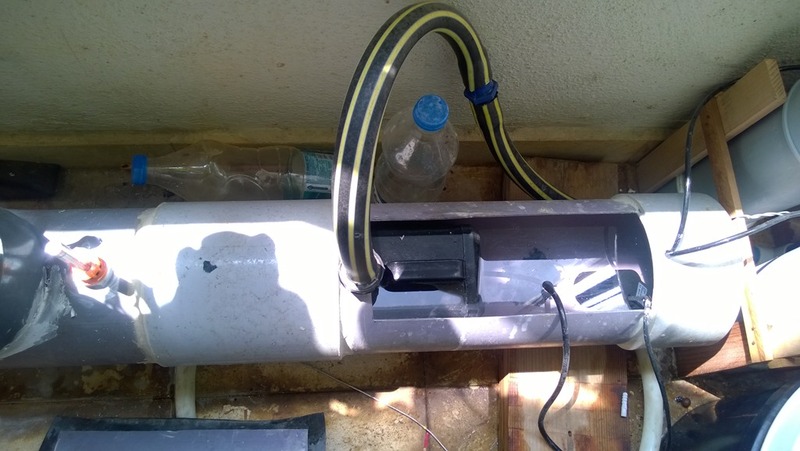 Wave Maker switch: As I said earlier the reservoir is equipped with Wave maker to mix Nutrients or pH modifiers. I could activate Wave maker any time by pressing the push button. I used this mostly after adding pH modifiers. 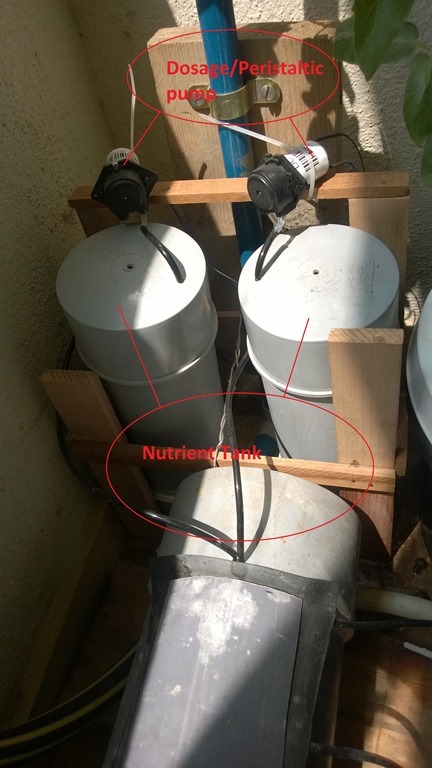 Nutrient feeding system will automatically switch on Wave maker after adding nutrients. 3. Nutrients Feeder switch: This push button switch will add 10 ml of nutrients to the reservoir. If I wanted to add more nutrients I could do that via the mobile application. 4. 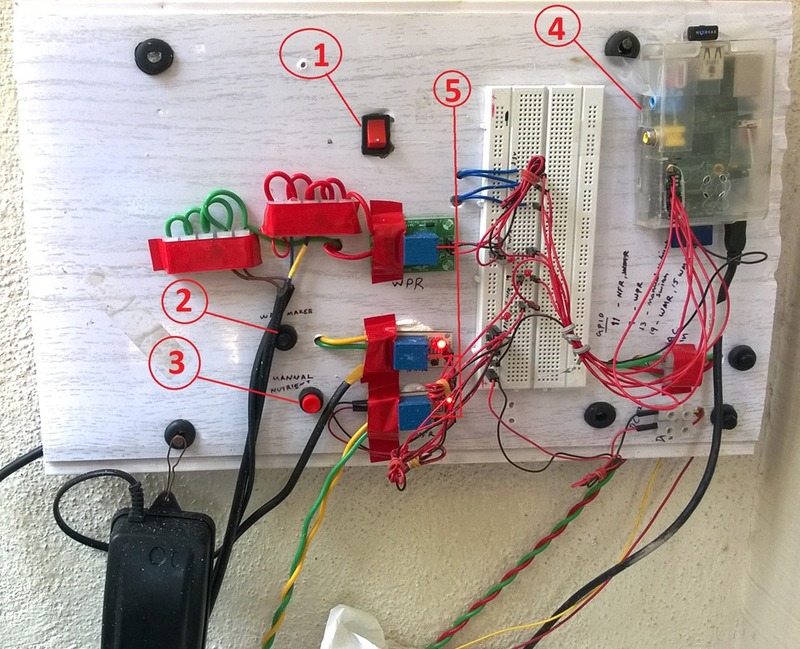 Raspberry pi: The brain of my Aeroponic system. Each and every component is connected to this device. The controller program is written in Node js. 5. Relays: component to switch on/off each hardware like Water pump, Wave maker, etc. The system is powered with a 12v DC and 240v AC. Each power source can be switched off separately by the two buttons below the Raspberry pi.